What is PANORAMICA and what's a panoramic texture? - Hemisphere (sphere cut in half - a dome). The result is the appearance of a realistic sky and/or horizon that surrounds your scene and allows you to move your 3D camera to most any angle. What's the deal with this unbelievable photorealistic shadowing and lighting? When used with radiosity, the textures provide a remarkable effect with lighting and shadows. Radiosity, provided with most 3D programs, is a method used to calculating the overall light propagation within a scene (global illumination). The main idea of radiosity is to store illumination values on the surfaces (textures and colors) of each object as the light is propagated, starting at the light sources. 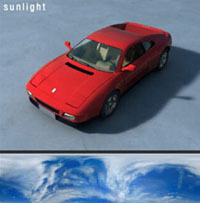 Radiosity produces a highly realistic lighting effect. And the more object surfaces that are included in a scene, the more realistic it is. 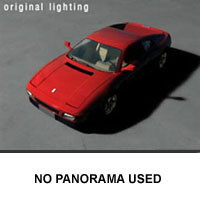 With Panorama, the radiosity calculation includes the colors in the sky and / or land textures, producing lighting and shadows that most emulate the real world. The panoramas actually serve as light sources! Four examples are show below. Using the panoramic textures with radiosity makes for ultra photorealistic renders. All ambient lighting in these scenes was enhanced with the panoramas. Notice the panorama below each rendering - each serves as a light source in the radiosity solution. What's the difference between Marlin Studios Panoramas and low-priced competitors' versions? PANORAMICA was created from actual photos shot with a Noblex Panoramic Camera. The resulting post-processed textures are in the 10,.000-pixel range. When you're creating a virtual environment, the sky is much closer than in the real world. Very high-rez sky textures are required to avoid the pixelization effect. These are the skies you see on the big screen in Hollywood films. Your clients deserve no less. How about the format of the panoramic textures? The textures are saved in lossless compressed TIFF format for maximum clarity. If the size is too large for a particular hardware / software system, they can be easily reduced using any conversion program. Why not create my own panoramic textures? Creating panoramic textures is quite complex, especially creating the hemispherical versions. Your digital camera is very limited in this type of photography. You can end up spending a great deal of money, plus days to weeks in photography and post production. The time and resulting cost involved in creating one panoramic texture can be far more than the price of this 2 CD-Rom set. PANORAMICA provides you with a broad range of cloud formations and outdoor environments, so you don't have to create them yourself. What exactly is included on the two CD-Roms? 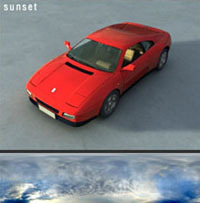 PANORAMICA includes 150 textures, as follows: 100 180 / 240 / 360-degree sky panoramas, 20 hemispherical sky panoramas, and 30 land backgrounds. 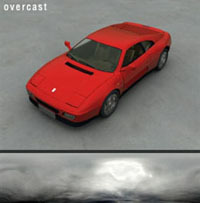 As a free bonus, the 2 CD-Rom set includes 6 Quick Time time-lapse cloud animations and 4 3D models that fit the textures, in 3DS, LWO and OBJ formats. In what applications are panoramic textures useful? PANORAMICA is particularly useful for both 3D and 2D artists involved in graphics work. The textures are perfectly suited for general-purpose 3D and 2D computer art and animation, computer games, architectural renderings, virtual reality applications, environmental web content development, visualizations, film industry CGI, print media applications, video/TV productions and historical reproductions. The textures can be used on all major platforms: PC, Mac, Alpha, and Amiga.